It was time to empty the Lucky Cat Bank. I mentioned last year how we got this bank from the Japanese pavilion at Epcot Center at Disney World. There was some lore with it. A white cat with the raised paw was to signify luck. You were to feed the cat but not count the amount of money you fed it. By this anonymous method, you watched the amount of your change grow. I couldn't get change to stay in the bank anymore as the interior contents were up to the slot at the back of the head. Originally, the bottom hole was covered with green felt. But that had to be removed in order to retrieve the coins in the bank. And we discovered quarters don't come out easily, so a groove had to be carved in the bottom hole and quarters had to be turned on edge and pulled out. 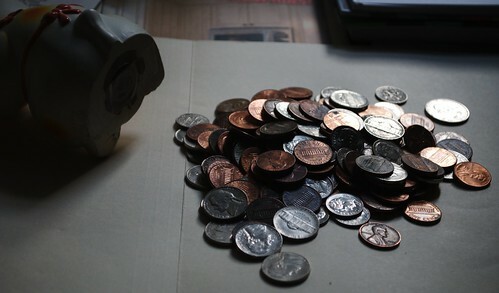 So, the only coins in the bank are pennies, nickels and dimes. When you don't spend them, however, eventually, they add up. I emptied the coins from my wallet. That's the pile to the right containing a few quarters. Then, I peeled the tape off the bottom and started shaking out the contents. It turned out to be a goodly amount of coinage. All of this goes into a bank Carole and I made over 10 years ago, right about the time her dad left us. We were feeling very low and wondering how we were going to make any ends meet, let alone pay the mortgage and utilities and provide for the few things she needed in high school. We decided we needed some symbol, something to rally around as emblematic of how we weren't going to be beaten down. 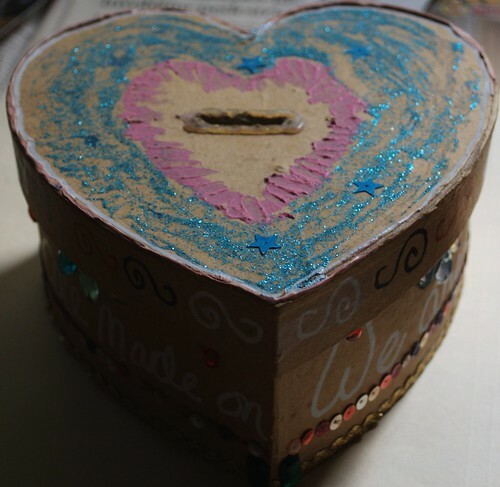 It's a heavy cardboard heart-shaped container. We decorated it and I used a quote from Shakespeare's Tempest Keep. Prospero says it in Act 4, Scene 1. I used this quote to remind us that as long as we had dreams, we were good. There are days when I don't believe my sentiments, but, for the most part, I have held to this. As long as I can dream, I am good. I have emptied this container three times since we made it. All the times were in preparation for a vacation. I don't empty it until the lid won't sit on it square anymore. It's about half-full now. Buried under the coins are a few dollar bills I added back in June. I try to resist the urge to fish them out. I can't remember when I emptied this last; I might be going on 2 years now. With a debit card in my wallet, I rarely carry cash about, although I have been doing that in an effort to keep track of where my cash goes. If all I have to spend is the $3.00 in my wallet, I'm going to think three or four times about buying that overpriced bottle of soda. I have no clue how much was contributed to the dream keeper. That's as it should be. If I remember correctly, I've turned in $117, $98 and $86 in coin and bills. 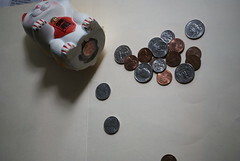 Remember how saving your loose change was something everyone did? You walked into a home and pretty much everyone had a change jar. My friend Terry had a jar that she and her hubby filled with pennies. It was dubbed the "Pennies for Paris" jar. They turned it in and put the proceeds into a fund to go to Paris. I remember her saying it wasn't much every time they turned it in, but it certainly added up. It may be an anachronism to save one's change. 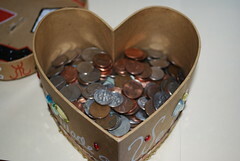 For me, however, it is a reminder of how far I've come when I can put a couple handfuls of coins into a dream.